Dolphins are “natural acousticians,” according to marine mammal behavioral biologist Denise Herzing. Individuals have signature whistles, just as we have names, and they can also send buzzes and tickles across long distances to physically signal one another. Echolocation clicks help them navigate in the water, and they erupt in bursts of squawks during fights. They also make ultrasonic noises that are impossible for humans to hear. Denise Herzing: Could we speak the language of dolphins? While researchers have paired some of this language with behavior, the nuances of these conversations remain untapped. Still, dolphins hint at a deep intelligence: their brains are big, they show signs of self-awareness, and some even use tools to help hunt fish. What are they saying? And, can we humans join in the discussion? As Herzing says in her enthralling talk from TED2013: maybe. She has been studying a group of wild Atlantic spotted dolphins off the coast of the Bahamas for 28 years, and lately she has collaborated with a research team at Georgia Tech on a wearable human-to-dolphin communication device called Cetacean Hearing and Telemetry. Or: CHAT. Rather than acting as a direct translator, CHAT provides a two-way acoustic interface through which the humans and dolphins can connect. CHAT is capable of playing manmade sounds corresponding to objects that the dolphins like to play with — including pieces of rope or seaweed, as well as the signature whistles that name individuals. Herzing and her team are also actively decoding other dolphin expressions. Eventually, they will incorporate both these and new assigned names identifying each human researcher back into CHAT for a more robust shared language. Koko the Gorilla. Psychologist Francine Patterson started teaching this famous lowland gorilla American Sign Language over forty years ago. Patterson and her collaborators claim that Koko now knows over 1,000 signs and can understand around 2,000 verbal words. For more information, see the Gorilla Foundation website or check out Koko’s YouTube channel. Nim the Chimpanzee. This controversial research project launched in 1973 sought to find out if a chimpanzee living in a human family could learn to communicate using a version of American Sign Language. Baby chimpanzee Nim was taken from his mother in a primate research center just days after birth and placed in a home with a Columbia University psychology grad student and her three children, under the direction of professor Herbert Terrace. The amazing 2011 documentary Project Nim chronicles the project, which had Nim living with multiple families, working day in and day out to learn words and sometimes even drinking and smoking with his human handlers. The doc reveals much regret on the part of the experimenters and answers the uncomfortable question of what happened to Nim after the project was shut down. Peter the Dolphin. Also in the highly controversial realm: neuroscientist John C. Lilly’s work with dolphin communication in 1958, which Mental Floss recently called one of “4 Bizarre Experiments that Should Never Be Repeated.” Interested in whether dolphins could learn language through constant contact with humans, Lilly had a male dolphin named Peter live with a female research associate, Margaret Howe, for 10 weeks in a home filled with enough water so that Peter could swim and Howe could wade. Howe slept in a water-logged bed and taught Peter English lessons, with him imitating the sounds she made and learning to retrieve objects on command. But the ultimate result of the experiment: Peter began to show sexual aggression toward Howe. Lilly wrote about this experiment, and his other work with dolphins between the years 1955 to 1978, in this book. Alex the African Grey Parrot. Mammals aren’t the only communicative animals. Irene Pepperberg’s famous parrot, Alex, knew over 100 English words, could count up to six (and sometimes to eight), and could identify various shapes and colors. Alex died unexpectedly in 2007 at the age of 31 (just middle age for such a parrot), but Pepperberg continues her research with other birds. To learn more, check out the Alex Foundation website or watch this short Nova documentary. The Interspecies Internet. 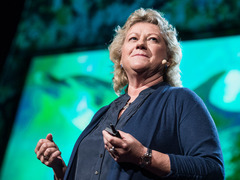 In this not-yet-released talk, also from TED2013, four panelists — cognitive psychologist Diana Reiss, musician Peter Gabriel, computer engineer Neil Gershenfeld and Vint Cerf, one of the fathers of the Internet — contemplated an even loftier goal than communication with another species: a new Internet to help connect humans to all intelligent animals, including dolphins, apes and elephants. The concept is based on Reiss’ work with dolphin communication via a keyboard, on Gabriel’s casual experiment in playing music with a bonobo, Gershenfeld’s work on the internet of things and Cerf’s work on the guiding principles of the internet. The four continue work towards this goal. Pingback: On Valentine's Day, These Adorably Odd Animal Friends Show There's Someone For Everyone | Oh Alright! Fascinating talk on animal communication but how about we go deeper and discuss telepathy between animals and, dare I say it, humans?